No Clear Alternative to Lea in Hal’s Hope at Gulfstream Park: Lea makes a rare appearance! With almost a year since his last race, where he won over Will Take Charge among other horses in the G1 Donn H., Lea is back to defend his title on Saturday, January 10, 2015 in G3 Hal’s Hope at Gulfstream Park. 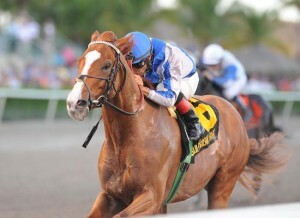 Lea, pictured above winning the 2014 edition of the G3 Hal’s Hope, is back to defend his title on Saturday, January 10, 2015 at Gulfstream Park. Similar to the Jerome a week ago, no clear alternative to the heavy favorite Lea exists. 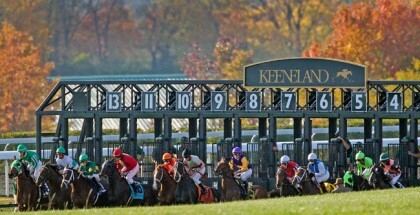 Lea may win or lose coming off a long layoff, but his best race certainly looks better than this field. 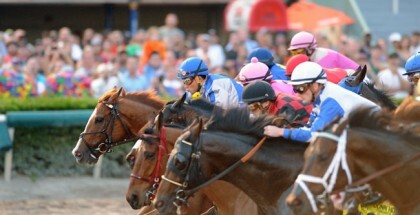 The only concern besides the layoff comes from the post position on the rail, which could lead to Golden Lad and Valid aiming to trap Lea, as happens often when a star horse competes. Golden Lad comes off a long layoff himself, not starting since May when the horse ran close to the pace in the G3 Pimlico Special before fading sharply, losing by 22 lengths. The effort seemed unusual for this Todd Pletcher trainee, as most of Golden Lad’s prior races showed him fighting until the end. In many circumstances, when a good horse loses by a significant margin in races not named the Kentucky Derby and goes on a long layoff, an injury occurred. As for Valid, the Medaglia d’Oro gelding loves Gulfstream Park with a 5-3-2-0 record. He fought hard in his recent loss to Liams Map, a talented horse that potentially can win graded stakes races going forward. Valid took dead aim and could not pass Liams Map. If Lea runs his best race here, he should hold off Valid, as well as Golden Lad in the lane. But again, coming off a layoff always brings questions, so if playing this race with alternative choices is a must, then Golden Lad and Valid are not the worst options. The next option is Prayer for Relief, a Dale Romans trained and Zayat Stables owned horse that runs fast enough races to win at the graded stakes level, yet almost never wins. The BRIS past performances go back 10 races, and Prayer for Relief shows zero wins in those ten races. Some of his good races though include the third in the G1 Woodward S. against Itsmyluckyday and Moreno, and the second to Revolutionary in the G3 Pimlico Special. A horse like Prayer for Relief is better off used in the underneath positions, or even backwheeled in exactas and trifectas. For those that do not understand what “backwheeling” means, if someone bets an exacta with other horses such as Lea, Golden Lad and Valid in the first position, and only Prayer for Relief in the second, that is a backwheel. As for the last two options Slim Shadey and Confrontation, well, miracles happen. Slim Shadey looks too slow on paper to win this race. The gelding just won a claiming race at Aqueduct back in November, and going from a claiming race to defeating Lea and company would surprise many. Confrontation, similar to Prayer for Relief, offers a little more intrigue for the underneath slots, only because trainer Barclay Tagg is conservative in race selection. Even though this one is outclassed on paper, with only nine starts for this five-year-old War Pass gelding, maybe room for enough improvement to hit the board exists. Use Confrontation underneath, if at all. Lea, if he runs anything close to prior form, will win. If something unusual happens, every horse except Slim Shady has a shot, with Prayer for Relief and Confrontation the best longshot options to use in the second, third and fourth slots of exotics. For free BRIS past performances, click here.